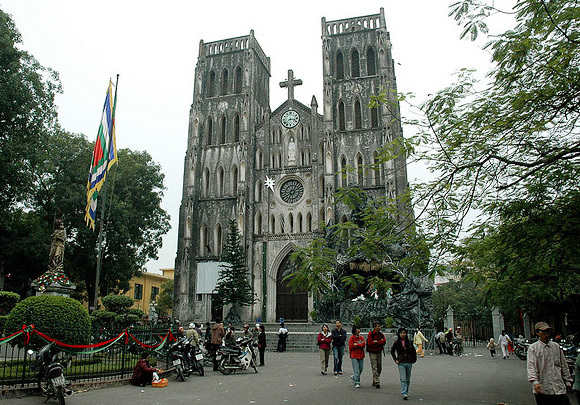 In 1882, after the French army conquered Hanoi, the cathedral was constructed and completed in 1886. The cathedral and Nha Chung area were built on the land formerly belonging to Bao Thien pagoda, which was built under Ly dynasty. The architecture with domes of the cathedral follows the Gothic style and design of Paris Cathedral. It is 64.5m in length, 20.5m in width with two bell towers of 31.5m-height. Though the appearance of the cathedral, from the doors, the colorful window glass, to the religious paintings for decoration follows Western style, the main interior part is decorated in Vietnamese way with two typical colors yellow and red. Outside, in front of the cathedral is the statue of Mother Maria. The first Christmas took place in the cathedral in 1887. Since then, the cathedral is always crowded with hundreds of people including both Christians and non-Christians at the weekend or during religious holidays like Christmas. Today, taking advantage of beautiful architecture and good venue at the center of the city, the area surrounding the cathedral is always packed with hundreds of local people and tourists hanging out with friends for drinking, talking, and watching the street. Nha Chung Street now becomes the “Lemon Tea” street, a popular gathering place to many youngsters in Hanoi, and home to eye-catching souvenir shops and Western style restaurants. It is not only the holly place for Christian couples hold their wedding, but also a great venue for non- religious grooms and brides to take nice wedding shots. From Hoan Kiem Lake head to Hang Gai Street, keep going until you reach Ly Quoc Su Street on the left hand side. Walk pass Ly Quoc Su and you will reach Nha Chung – the Cathedral is the connecting point of these two streets.